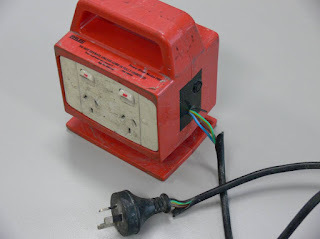 This portable socket outlet assembly was found on a metal roof at a construction site, with equipment plugged into every socket outlet. It was also at the end of a run of multiple extension leads approximately 65 metres long; this is more than 40 metres longer than allowed for a normal extension lead. While it did have a test tag fitted, it was three years out of date. As expected, the inspector was not impressed and notices were issued.